A COLORFUL AND INFORMATIVE first glimpse into the diverse world of reptiles. With the help of the beautifully detailed illustrations from noted wildlife illustrator John Sill, About Reptiles explains the basic characteristics that all reptiles share, while offering a look at the animals that fall into this diverse category. An afterword provides further detail on the animals portrayed to inspire young readers to learn more. 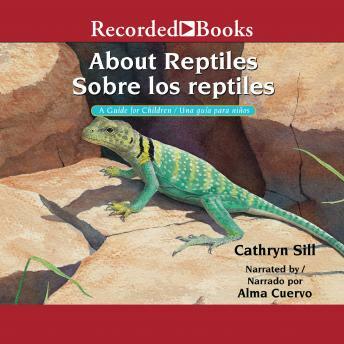 In this easy-to-read introduction to reptiles for children, elementary school teacher and author Cathryn Sill explains what reptiles are, how they live, and what they do.